Yup. No renovations. I hear you honey. No renovations for the first year. But paint doesn't count does it? The purple front door on the farm house was driving me nuts. Not that I don't like purple, it was oddly soothing in it's vibrant hippy way. But I am just not a purple fan. 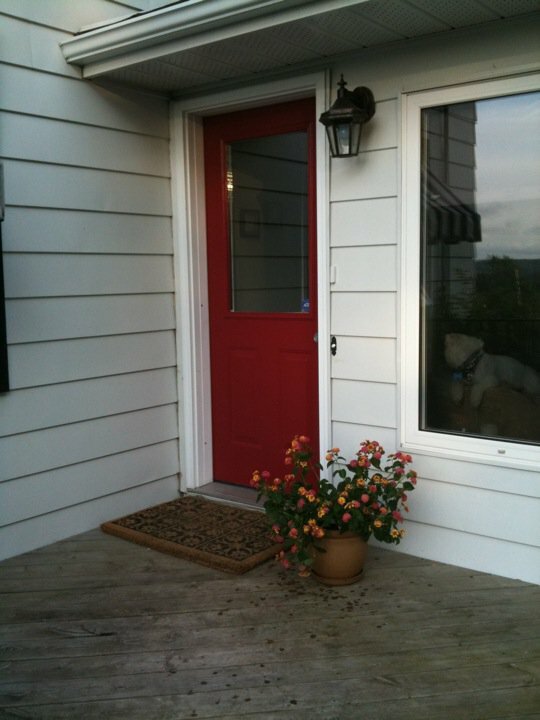 I wanted a red front door. And so one day when he was at work, I dug out the painting supplies and rolled up my sleeves. Here is the result. Not bad if I do say so myself. The plant next to it is Lantana, my favorite plant. I only wish it lasted all year. This year I am going to try and pull it inside to winter it, but I am afraid it's a very "sensitive" breed and may not make it. For now, I will enjoy it in full summer bloom.